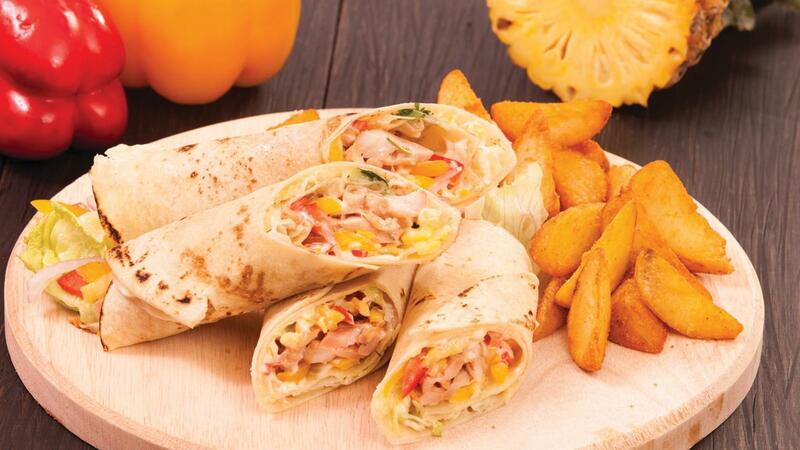 Nothing better than a little Hawaiian twist to a BBQ Chicken Wrap. We have used Knorr Chicken Seasoning Powder to boost taste, and layered the filling with Hellmann’s Real Mayonnaise for perfection! These Hawaiian BBQ chicken wraps are easy to prepare, healthy and delicious. View the full recipe below. Marinate the chicken strips with garlic, pineapple, tomato ketchup, curry leaves, curry powder, Knorr Chicken Seasoning Powder, Knorr Lime Seasoning Powder and oil for minimum 3 hours. Place the marinated chicken in a baking tray and baked them at high temperature until golden. Mix garlic, coriander with Hellmann's Classic Mayonnaise. Flash heat the tortilla wraps for a few seconds before spreading little mayo on top. Place ice berg & vegetables before adding BBQ chicken, spread with more garlic mayo and finally place the pineapple. Close the wrap and serve with French fries.